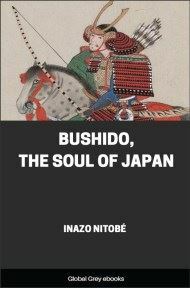 Bushido: The Soul of Japan written by Inazo Nitobe is, along with the classic text Hagakure by Tsunetomo Yamamoto, a study of the way of the samurai. A best-seller in its day, it was read by many influential foreigners, among them President Theodore Roosevelt, President John F. Kennedy and Robert Baden-Powell. It may well have shaped Baden-Powell's ideas on the Boy Scout movement he founded. It argues a sad defect of information concerning the Far East, when so erudite a scholar as Dr. George Miller did not hesitate to affirm that, chivalry, or any other similar institution, has never existed either among the nations of antiquity or among the modern Orientals. Such ignorance, however, is amply excusable, as the third edition of the good Doctor's, work appeared the same year that Commodore Perry was knocking at the portals of our exclusivism. More than a decade later, about the time that our feudalism was in the last throes of existence, Carl Marx, writing his Capital, called the attention of his readers to the peculiar advantage of studying the social and political institutions of feudalism, as then to be seen in living form only in Japan. 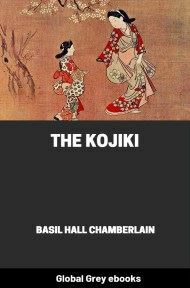 I would likewise point the Western historical and ethical student to the study of chivalry in the Japan of the present. Enticing as is an historical disquisition on the comparison between European and Japanese feudalism and chivalry, it is not the purpose of this paper to enter into it at length. My attempt is rather to relate firstly, the origin and sources of our chivalry; secondly, its character and teaching; thirdly, its influence among the masses; and, fourthly, the continuity and permanence of its influence. Of these several points, the first will be only brief and cursory, or else I should have to take my readers into the devious paths of our national history; the second will be dwelt upon at greater length, as being most likely to interest students of International Ethics and Comparative Ethology in our ways of thought and action; and the rest will be dealt with as corollaries. The Japanese word which I have roughly rendered Chivalry, is, in the original, more expressive than Horsemanship. Bu-shi-do means literally Military-Knight-Ways--the ways which fighting nobles should observe in their daily life as well as in their vocation; in a word, the "Precepts of Knighthood," the noblesse oblige of the warrior class. Having thus given its literal significance, I may be allowed henceforth to use the word in the original. The use of the original term is also advisable for this reason, that a teaching so circumscribed and unique, engendering a cast of mind and character so peculiar, so local, must wear the badge of its singularity on its face; then, some words have a national timbre so expressive of race characteristics that the best of translators can do them but scant justice, not to say positive injustice and grievance. Who can improve by translation what the German "Gemŭth" signifies, or who does not feel the difference between the two words verbally so closely allied as the English gentleman and the French gentilhomme? Bushido, then, is the code of moral principles which the knights were required or instructed to observe. It is not a written code; at best it consists of a few maxims handed down from mouth to mouth or coming from the pen of some well-known warrior or savant. More frequently it is a code unuttered and unwritten, possessing all the more the powerful sanction of veritable deed, and of a law written on the fleshly tablets of the heart. It was founded not on the creation of one brain, however able, or on the life of a single personage, however renowned. It was an organic growth of decades and centuries of military career. It, perhaps, fills the same position in the history of ethics that the English Constitution does in political history; yet it has had nothing to compare with the Magna Charta or the Habeas Corpus Act. True, early in the seventeenth century Military Statutes (Buké Hatto) were promulgated; but their thirteen short articles were taken up mostly with marriages, castles, leagues, etc., and didactic regulations were but meagerly touched upon. We cannot, therefore, point out any definite time and place and say, "Here is its fountainhead." Only as it attains consciousness in the feudal age, its origin, in respect to time, may be identified with feudalism. But feudalism itself is woven of many threads, and Bushido shares its intricate nature. As in England the political institutions of feudalism may be said to date from the Norman Conquest, so we may say that in Japan its rise was simultaneous with the ascendancy of Yoritomo, late in the twelfth century. As, however, in England, we find the social elements of feudalism far back in the period previous to William the Conqueror, so, too, the germs of feudalism in Japan had been long existent before the period I have mentioned. Again, in Japan as in Europe, when feudalism was formally inaugurated, the professional class of warriors naturally came into prominence. These were known as samurai, meaning literally, like the old English cniht (knecht, knight), guards or attendants-- resembling in character the soldurii, whom Cæsar mentioned as existing in Aquitania, or the comitati, who, according to Tacitus, followed Germanic chiefs in his time; or, to take a still later parallel, the milites medii that one reads about in the history of Mediæval Europe. A Sinico-Japanese word Bu-ké or Bu-shi (Fighting Knights) was also adopted in common use. They were a privileged class, and must originally have been a rough breed who made fighting their vocation. This class was naturally recruited, in a long period of constant warfare, from the manliest and the most adventurous, and all the while the process of elimination went on, the timid and the feeble being sorted out, and only "a rude race, all masculine, with brutish strength," to borrow Emerson's phrase, surviving to form families and the ranks of the samurai. Coming to profess great honour and great privileges, and correspondingly great responsibilities, they soon felt the need of a common standard of behaviour, especially as they were always on a belligerent footing and belonged to different clans. just as physicians limit competition among themselves by professional courtesy, just as lawyers sit in courts of honour in cases of violated etiquette; so must also warriors possess some resort for final judgment on their misdemeanours.